On Sunday, I decided to do something entirely different. Actually, my dad decided for me, since I was mostly delirious. Dad and Ricky coaxed me into the car, nonetheless. Though I was wildly opposed to hospitals, they carried me to Mountaiview in Payson. I had another fairly dramatic stroke, a second attack. For a time, as artery after artery blocked off from circulation, my blood pressure rose and soared to levels I never knew a human could even produce, let alone sustain. 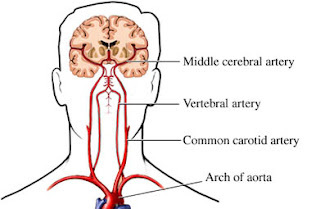 Blood pressure rose as the heart muscle continued to attempt to supply blood to the blocked and dying brain cells. The medical team saved my life. They were finally able to control the runaway blood pressure. But at what terrible cost. New brain damage, even now some of the consequences reveal themselves. Thank God the thinking part of my mind was mostly spared from the carnage. I can still think. But tonight I sit at a workstation in the rehab center at Utah Valley hospital. I've been checking here several times a day, hoping to hear word. These aren't the words I was hoping to hear, but at least now I know. Jim, you have folks who care about you and are hoping and praying for the very best outcome. I understand you don't like doctors or hospitals or anything like unto them, but please let the doctors do their work. Stroke science and rehabilitation are pretty cutting edge. But yes, more hard work, not just with rehab but with finding out why this is happening and turning it around. I, along with others who care about you, will stick with you for as long as it takes. If there is anything else I can do to help you through this, I hope you'll say so. I wish I could come up there and see you. If I were still living in Payson, I would. Just another note to say I'm thinking about you and hope circumstances turn around soon. Also, I hope you're behaving and letting the docs do their jobs. All the choices we have to make every day. Yet it's those choices that help make our brains what they are. Besides blood and oxygen, brains run on choice. You have (at least) four of us here in Texas who are rooting for you as well. I can't imagine how devastating this has been for you - after you had come so far! But we are pulling for you, praying for you, and wanting to have you well again soon. We love you. We hope. We believe. Hi, Jim. Bothering you with another get well note. I know you're working and living hard to find out what's possible. Many things remain possible. Best wishes from Patricia. Thank you for your kindness. I am gratified to know the people who care. It makes this troublesome burden easier to carry. I have learned some rather grim news about what is happening to me, and the picture for my future outlook is not too promising, but I am resolved to make the best of it. One of the doctors who has helped evaluate my condition advises me that my "executive decision-making" capacity is severely impaired in the latest stroke, and he advised me to seek to compensate with planning tools and rigid scheduling and regular protocols to follow. He recommended to start using my pocket pc for more than just running the GPS. That will take some work, because I tend to be a sloppy spontaneous kind of person. But I can do this, if it will help make my life worth something again. The other thing this doctor agreed with me on is that my remaining may be short - maybe very short. I need to put my affairs in order right away just in case. At least I get fair warning. Maybe I get a little advance note of impnding demise just as a courtesy. In any case, it just motivates me further to get back on track as quickly as possible. Then one way or another, we must meet.